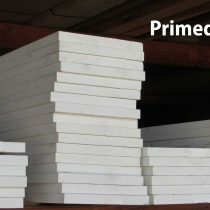 Our Primed Pine boards are stocked in 16′ lengths only. Boards are made of finger-jointed clear Radiata Pine with an exterior grade primer. These boards can be used interior or exterior. These boards are often used for exterior trim, fascia, bookshelves, shelving and furniture. Boards can be cut at our saw-house for easier transportation.